Tooele’s Josh Wilkins (1) looks for a way around a defender during a game against Park City last season. Wilkins and the Buffaloes went 1-1 at the Central Utah Boys Basketball Preview in Richfield this past weekend. Stansbury’s Jet Richins (10) looks for an open teammate during a home game last month against Bear River. Stansbury lost a pair of games this past weekend at the Central Utah Boys Basketball Preview in Richfield, falling to Dixie and Desert Hills. Grantsville’s Jackson Sandberg (12) goes up for a layup during a home game against West Wendover (Nevada) last month. 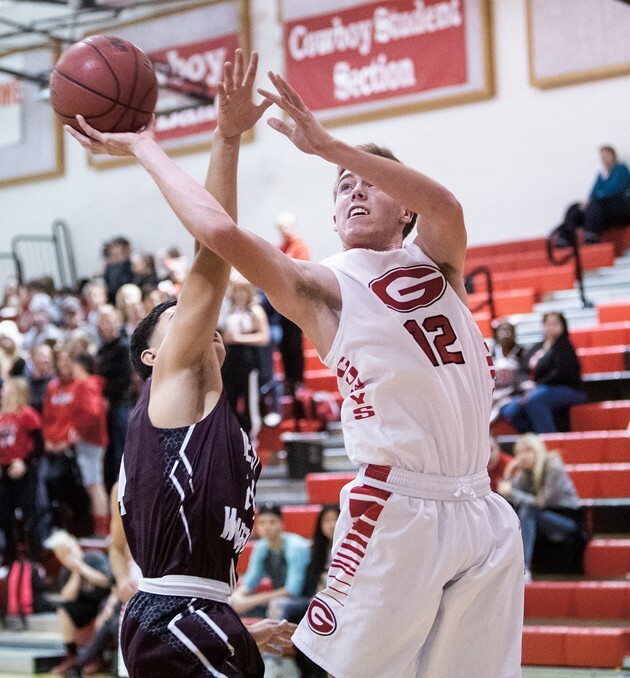 Grantsville lost games to Manti and Delta during the Central Utah Boys Basketball Preview this past weekend in Richfield. The boys basketball teams from Tooele, Stansbury and Grantsville all hit the road this past weekend to take part in the annual Central Utah Boys Basketball Preview, a two-day event that brings some of the top teams in Class 3A and 4A together for an early look at how things might sort themselves out come February. Tooele had an impressive showing, edging Pine View before a tough loss to Dixie. 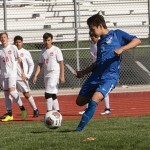 Stansbury nearly beat Dixie on Friday, but struggled in a loss to Desert Hills. Grantsville had a rough weekend with double-digit losses to Manti and Delta. 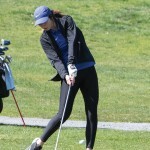 Here’s a quick look at how things went for the three Tooele County squads. 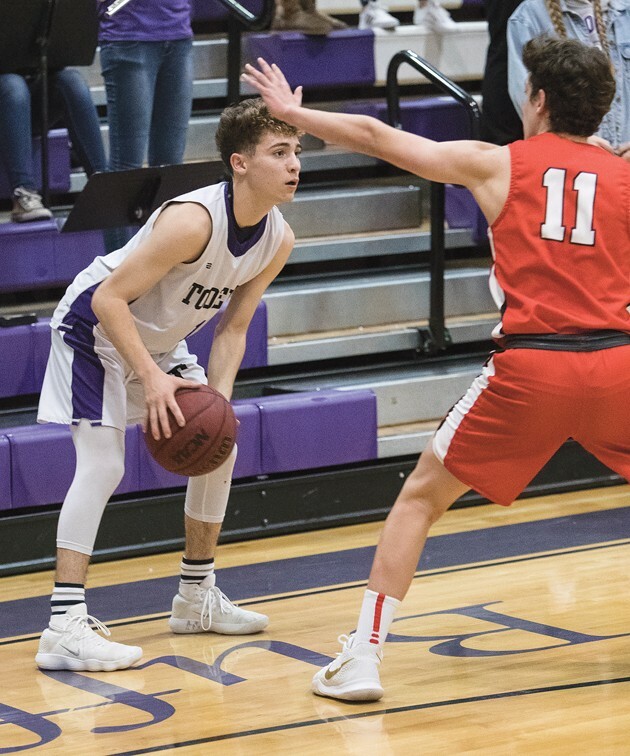 The Buffaloes (2-1) struggled in the middle two quarters against Pine View as the Panthers outscored them 35-18 and built a 44-36 lead entering the final eight minutes. But Tooele came storming back, outscoring PV 23-12 in the final frame to pick up the three-point win. Sophomore center Justin Rogers just missed a double-double with 19 points and nine rebounds. Senior Nathan Swan had eight points and eight rebounds and Clay Freeman had nine points and seven rebounds. Freeman and Swan each added three steals. Things didn’t go as well for Tooele the next morning as the Buffs fell behind 41-19 at halftime after scoring just five points in the second quarter. Rogers had another monster game with 26 points, 10 rebounds and four steals, and Josh Wilkins added 12 points. 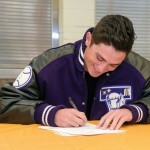 Tooele played host to Hillcrest in its home opener Tuesday night. The game was not complete at press time. Stansbury (1-3) built a 10-point halftime lead against Dixie on Friday, but the Flyers rallied in the second half to beat the Stallions late. Peyton Thevenot led Stansbury with 19 points in the loss, nailing five 3-pointers. Pae Tia added 17 points. 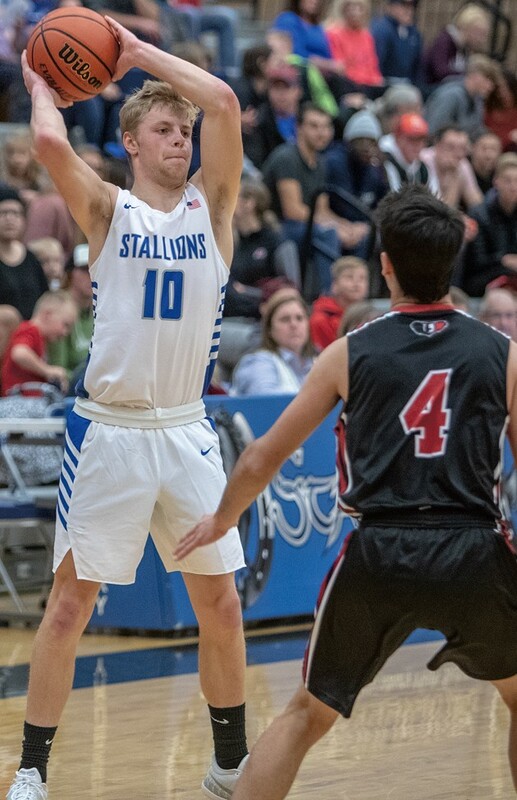 Saturday morning against Desert Hills was a struggle for the Stallions, who trailed 18-4 after the first quarter and never recovered. Thevenot had eight points in the loss to the Thunder, with Dave Spaulding adding five. Manti pulled away in the second half to beat Grantsville (1-3) on Friday as the Templars built on a four-point halftime lead. Kayden Bohman led three Cowboys in double-figures with 13 points. Isaac Riding and Jackson Sandberg each had 11 and Ammon Bartley had seven. On Saturday, the Cowboys led Delta by five points after the first quarter, only to see the Rabbits outscore them 23-6 in the second quarter on the way to a 24-point victory. Delta’s Derek Smith hit six 3-pointers and scored 34 points. Sandberg led Grantsville with 15 points and 10 rebounds and was 7-for-7 from the free-throw line as the Cowboys went 11-for-11 as a team. Seth Beckett hit two 3-pointers and scored eight points. Grantsville will face West on Wednesday night in Salt Lake City.